In her elegiac final novel, the late Adams picks up the story of Cynthia and Harry Baird where she left off in A Southern Exposure (1995). It’s now August 1944, and Cynthia is home in Pinehill, the southern college town to which the couple relocated during the Depression. Harry, a naval officer, is stationed in London; daughter Abigail is about to start at Swarthmore. The opening scene, a party for Abigail and her Radcliffe-bound friend Melanctha Byrd, sets the stage with Adams's customary deftness. Cynthia is having an affair with war correspondent Derek McFall, who is “not in love with her, not at all.” Her maid Odessa, a stately black woman whose husband is also in the Navy, likes Cynthia but has little use for “her supposed best friend” Dolly Bigelow, a near-caricature of the bigoted southern belle who later proves to be not quite as dumb or prejudiced as she seems. Melanctha's father, alcoholic poet James Russell Lowell Byrd, and his much younger second wife, Deirdre, are among the other locals in attendance as readers absorb the town's ingrown, gossipy nature. Up north, meanwhile, Abigail falls in love with James Marcus, son of New York Jewish communists satirized with wicked accuracy as straitjacketed by their world's conventions just as tightly Cynthia's southern neighbors. 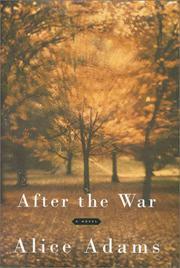 Despite a plethora of love affairs and two deaths, almost everyone is essentially marking time, aware that America will be dramatically different “after the war.” The story closes two years later with a wedding. Most of the characters (depicted with Adams's trademark sensitivity) have made meaningful changes in their lives; even Cynthia and Harry's complex marriage seems to be healing after a rocky reunion. As in most of Adams's fiction, the quiet narrative concerns itself less with political issues (though white racism is a constant subtext) than with personal struggles, which coalesce to create an overall atmosphere of a slightly anxious yet always eager embrace of life's possibilities. Tender, funny, and touching: a fitting close to an admirable career.